It’s been a big month on the Trump golf beat. At the beginning of April, sportswriter Rick Reilly released Commander in Cheat: How Golf Explains Trump, a slim, fun book with an abundance of detail on how in sport, as in life, the president can’t help but bend the rules in his favor. 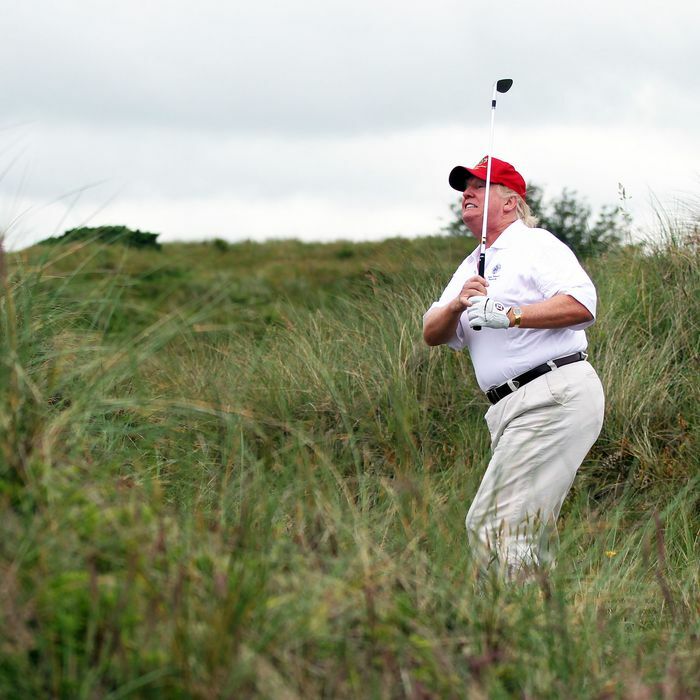 Now, in a new report from Politico, more details emerge on the president’s relationship with his favorite pastime: according to TrumpGolfCount, he has hit the links at least 116 times in his 814 days in office, a little less than once a week. Politico notes that Trump uses the game as both an escape from the presidency and as a roving version of his “Executive time”: “unscripted hours in which his presidency unfolds in spontaneous conversations, phone calls, and occasional policy chats with athletes and celebrities.” One instance stands out: In 2017, amid the Republican tax overhaul, Trump reportedly asked Tiger Woods for his thoughts on a tax bill moving through Congress. As for foreign policy, Trump has golfed with Shinzo Abe three times on the Japanese prime minister’s visits to Mar-a-Lago, and once with the Australian ambassador to the U.S. “Some ambassadors in Europe have begged me to tell them what they need to do to nail a golfing opportunity with President Trump, even for one hole,” a senior government official told the Japan Times in April 2018. For a man who loves to spend other people’s money, Trump, oddly enough, hasn’t used golf as a fundraising tactic all that often. Though Trump has held private events at his golf clubs, the president is apparently hesitant to turn his personal time on the course into a conduit for campaign money. Apparently, he hasn’t needed to, either: On Sunday, the Trump campaign announced a $30 million haul in the first quarter, almost $12 million more than the closest 2020 Democrat.